Jack has a son, about 11 or 12, named David. Was obviously once married (to whom?). Jack tells Sayid that the temple-dwellers wanted to poison him. My guess, that probably wasn't a wise thing to say, especially with Sayid being infected with "the darkness". Claire is batshit crazy. He killed a guy with an ax! An axe right in the gut — for not believing him that the Others don't have Aaron! In an effort to save this poor man's life Jin tells Claire the truth, that Kate took Aaron 3 years ago (I mean, nobody knew where Claire was, we all thought she was dead, or exploded or whatever, right?) It doesn't matter, batshitClaire kills the guy anyway, which makes Jin rethink his truth-telling bit and he claims "Oh, I just made that up - don't-kill-me-crazy-lady". Hurley and Jack find what they were sent to find. A Lighthouse (very Riven like). Inside this lighthouse is a donkey-wheel, sort of. On it are numbers and names (which I assume match what is in the cave where Esau/Smokey/Not-John-Locke too Sawyer) but as you turn the dial (which moves the mirrors) you see different things in the reflection. Jack notices it; and tells Hurley to go to "Shephard" (23). He sees the house where he grew up, freaks out and smashes the mirrors. Jin promises to bring Claire to the Temple, to show her Aaron (since he lied and says that where he is; I'm guessing he believes that they'll be able to subdue her in some way). Claire wants to bring her "friend". Claire has a friend — and guess who it is? Not-John-Locke of course. Awhile back, when we first saw Jacob on the beach watching the "Black Rock" sail toward the island I suspected that these two men, the ying-yang, the black and white, the good and evil; might in fact be Jacob and Esau and the island is the birthright that Esau so desparately wants back from his brother (Genesis 27:41). I'm assuming this is part of the mythology, along with a healthy does of Egyptian and Greek mythologies. I'm also assuming that Jacob intends to bring Christian to the island (which is probably be why he's missing in multi-verse). Also, the more I watch this season the more I'm convinced that Damon and Carlton are fans of Myst/Riven (and if you've never played these games, you really missed out). Who is the "someone bad" that is coming to the Temple, one assumes it is Not-John-Lock/Esau/Smokey, or is it Claire (she is batshit crazy afterall)? Christian Shephard is a key player. What has happened to Charles Widmore, Dharma, the battle to get back to the island and control it -- are they all working for Esau/Not-John-Locke? Where was Sawyer? We see NJL visit Claire, is Sawyer right behind him? What does the Lighthouse do? Aside from "seeing" things, did it also "transport" Jacob to these areas? is it a portal? How else will this "friend" of Jacob's get to the island. What will become of Kate. She's neither with the Temple of Doom people, nor with Not-John-Locke; she will obviously be forced to decide between Sawyer and Jack again. Comments for "Recap: LOST 'Lighthouse' (S6, E5)"
I think the other guy coming to the Island is none other than....WAAAAAAAALLLLT! My head hurts, where's the Tylenol??? I think the person Jacob is trying to get to the island is Desmond. Although, it could be Charles, Walt, or Eloise. Also, this ep was the 108th Lost ep produced. The castaway version of Jack had his appendix removed on the Island back in season 4. Juliet performed the surgery, and Jack initially wanted to perform the surgery on himself, and even when Juliet talked him out of it, he still tried to coach her through the process by... watching her in a mirror. I too am curious about Widmore and that whole gang. The main antagonist has definitely switched to NJL and I am not sure how the other bad guys all fit in. I am interested to see how it all works out. -Robozo -- GOOD memory. Forgot about that (clame for recap of that one). Fringe uses mirrors as a means to "see" the multi-verse; seems like LOST is borrowing a tad from that. I think Desmond is the one coming to the island: #108 on the Lighthouse-Donkey-Wheel is "Wallace." But I like this Christian idea. Did you notice that Jack overcomes his lifetime issue -- father/son communication breakdown -- in the alternate timeline? Just like Locke overcame his i-can't-accept-being-limited issue in the last episode, and Kate got over herself enough to help Claire get to the hospital. I don't know what it means, but going back in time and detonating the bomb has certainly helped each of them make progress in the alternate timeline. Island-as-birthright is a fun possibility. I have been saying this since the beginning that Christian Shepard is a key player. He has to be. He is Anakin Skywalker. He's got two kids on the island. I think Christian has been on the island before and his raising of Jack has been in preparation for the island. Also Claire says that she has not been alone but with her Dad and her friend. Maybe Christian wasn't under Smokey's spell. I think it plays well that Jack may have to kill his father. Also, who is Jack's wife in the alternate story? My hunch is that it's Juliet. Also I am gambling big time that Jack's son David has a piano teacher named Daniel Faraday. They were playing the same exact song on the piano. I still think these stories are going to converge and that they are not multiverses. Or that the island story will end and we'll be left with the alternate story. I think one big question you missed was who is Wallace? There was a name on the dial for a Wallace. Could it be Waaaaaalt!? or Desmond? Ooooooo, I like the idea of Jack killing his father, though I'd prefer Christian to kill Jack (Jack's pretty annoying). Juliet eh? That's not a bad guess. Did they show any pictures when Jack was in their house? Also, Faraday is the piano teacher would be pretty great. just saw this post but i have to say - that's one well-placed Myst joke right there. 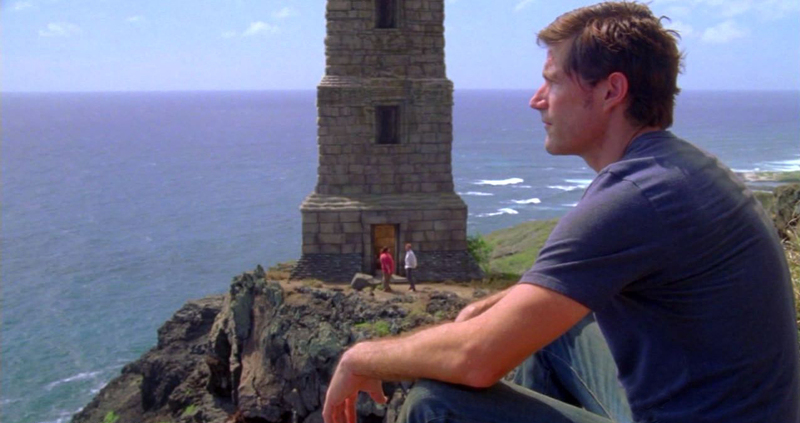 Comments are turned off for "Recap: LOST 'Lighthouse' (S6, E5)"